Doctor Who keeps making progressive strides alongside classic sci-fi adventure in its latest episode. “The Witchfinders” is only the second episode in the show’s 55-year history to be written and directed by women. Writer Joy Wilkinson and director Sallie Aprahamian crafted a properly creepy Who adventure that made kids cover their eyes and duck behind couches like the Daleks did in the ‘60’s. Thirteen and her TARDIS crew arrived in 17th century Lancaster during the height of witch hunting. Unsurprisingly, a powerful White woman (Becka Savage) was at the center of upholding patriarchal standards to somehow elevate her status as a “godly” woman. The theme of misguided religious beliefs and how they often come at the expense of women’s autonomy over their lives was a major, and timely, theme in the episode. The crew witnessed one heartbreaking (and completely ridiculous) witch “trial” where the accused was chained and dunked into a body of water. According to the rules, if she drowned like a living, breathing human, then she was not a witch. And, if she lives, then she was evil and subject to being hanged. This real-life lose-lose situation left women who lived outside the standards of society (much like this Doctor) at the mercy of anyone who deemed them to be a threat. 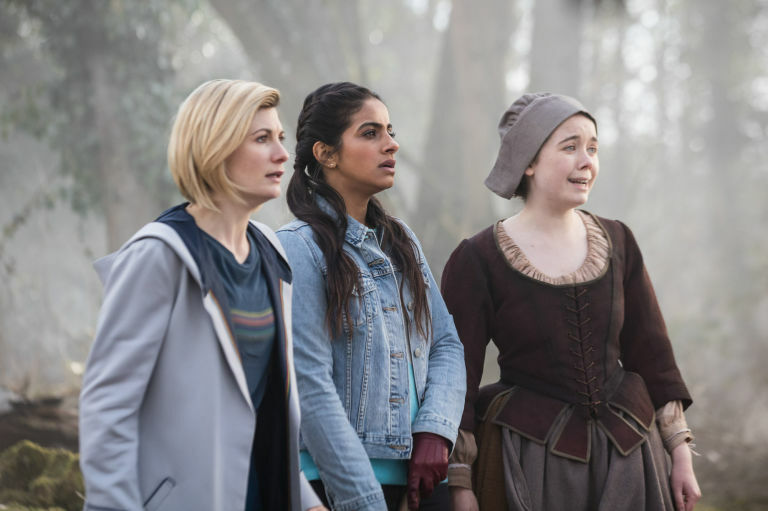 The Doctor has been getting schooled on her own White privilege this season, but now she’s getting a taste of what it means to be a woman. I have always been curious about how The Doctor would establish herself as an authoritative figure after years of rarely being questioned as someone who previously presented as male. This question was deeply explored when she came face to face with King James, who couldn’t believe that a “lassie” could be a Witchfinder General. His convictions about what a woman could do was so strong that he read the psychic paper as her being the assistant. Of course, Graham was assumed to be in charge as a White male because there would be no way that Ryan, a Black man, could have such authority I suppose. The Doctor herself remarks that if she were a bloke then she could go about doing her job without being interrogated at every turn. The exchange between King James and The Doctor as she waited for her witch trail was by far one of the best scenes in this season. He wanted to know all of her secrets and she came back with so many quotable lines that it made fans head’s spin. Thirteen dug into him about how knowledge must be earned and grills him about the darkness in his own heart as he uses people as scapegoats by killing them without just cause. LOOK AT ALL THESE TRUTH BOMBS BEING DROPPED BY THE DOC. 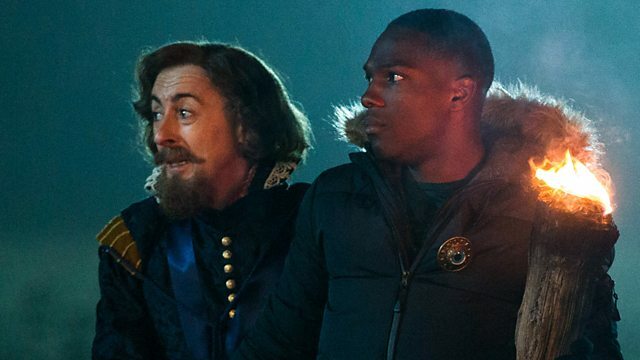 It was a thrilling scene that gave Whittaker yet another chance to absolutely stun fans as The Doctor. I also appreciated the thorough dragging she gave Ms. Savage after she called her out about being the one who was truly evil. It turns out the strange happenings were her fault because she released the very dangerous Morax crew from their tree-like prison after chopping it down for no reason. It’s impossible to feel sorry for her as she is possessed by the Morax leader and I can’t blame King James for taking her out in the end. She made an effective human and alien foe as well as the very creepy army that inhabited dead women’s bodies. I thoroughly enjoyed King James not-so-subtle attempts to flirt with Ryan. It was reminiscent of Shakespeare making moves on Martha Jones, but in a much, much less creepy and fetish-like way. And who can blame him for wanting to fall in love with that Nubian Prince? But, what really impressed me was how Ryan responded to the actions. He was confused at first and then mostly amused, but it was nice to see him not get angry and “defend” his masculinity because a man was hitting on him. I stan a non-homophobic time traveling companion. And, Graham’s Pilgrim hat deserves a standing ovation. He looked absolutely ridiculous for most of the episode and it made me smile amidst the underlying heaviness of the plot. Graham is the master of accessories and I have to admit that he has grown on me throughout this season. Thankfully, Yaz was given a ton to do. I was worried about her wandering around by herself during this time period, but I appreciated the chance to see her peel back more layers about her personality. She admitted to Willa that she had been bullied and suffered from crippling fear and anxiety. It was very much so a classic companion move to connect with others humanity and help them come to a major epiphany in the episode. Once again, season 11 delivers a thoroughly entertaining historical episode with an alien twist.